The easiest way to add these accessories to your connector is to make a kit. 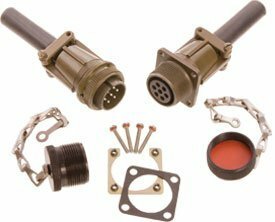 Simply add to the end of your part number the modifier for the kit that best meets your needs and those accessories will be matched to fit your connector perfectly. To add accessories to the set we are building, we can simply select the 02 kit in the part builder to get a matching cover, mounting gasket, and cable bushing. for our receptacle. For our plug, the 01 kit provides a protective cover and a cable bushing.